Today I spent almost the entire day cleaning and organizing my room. I know, I know, I posted about about keeping your room clean on Monday and only now actually finished cleaning mine? Yes, well, life happens. Though I thought this week was going to be less busy, Monday saw me recovering from the musical, Tuesday, sewing with Natalie, Wednesday, shopping with Mom and getting my first doctor check-up in 13 years, Thursday, taking a piano lesson, playing games with Jubilee and her friend and babysitting, and Friday, spending some girl time with my sister and her friend watching Pride and Prejudice, then playing games with them again. Thursday afternoon left me a little time for sorting, but Friday afternoon and evening gave me the real opportunity to begin tackling the mess of my room. I hadn't been as diligent straightening up each day, for I'd been putting things off until I could really go through, get rid of, or find a place for everything. Today, between eating meals and playing games with Jubilee (we do it at the same time if we have the chance, in order to make the most of the time!) I sorted and cleaned basically all day. There were pleasant breaks to check online, talk on the phone with my dearly missed brother, and make strawberry milkshakes for supper (yum!) but most of th day was spent organizing. There's something wonderful about going through things and putting everything in order. There were also pleasant trips down memory lane as I organized my childhood memorabilia. Most of the special childhoods toys or trinkets were once again tucked away in my hope chest to save for my own children, but there were other things that I didn't really need that are bagged and waiting to give away to others. I relived memories and noteworthy moments as I flipped through the journals I've kept since age 6 or looked through letters or notes I'd received from friends. I've also gotten joy out of throwing or giving things away! Though there are a few sentimental treasures that have no real use but I keep anyway, most things that I don't use are gotten out of my room. I filled the trash with papers that were unneeded, bagged up clothes I'd worn out or just never worn much, and made a pile of things for my mom to look through. It's wonderfully freeing to get things out of my room! 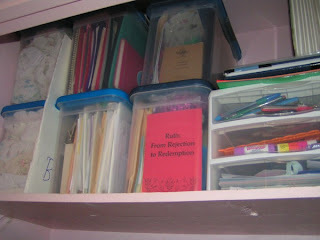 The above picture is of my closet's upper shelf, organized with things in plastic containers. Isn't it amazing how much one can fit in so little room when you stack things in good containers? Last year my sister and I bought these from Walmart, and it's allowed me to store so much easily in little space. Two hold bed linens, one notebooks and papers I'd like to keep, one notebooks, papers, and mementos from teaching ballet and directing musicals, one with things I've gotten on sale to give as gifts, and one holding materials to use for drama. Then there's the three-drawer container with my scrapbooking supplies, and on top of it, a scrapbooking paper and sticker organizer (which you can't see in the picture). Not only do I have these plastic containers in the closet, but I have more in my sewing cabinet, one to organize embroidery stuff, one to organize knitting/crochet materials, and others to hold cloth. I've got a bigger plastic container of cloth to slide under the bed, and another big plastic container in the bottom of my closet holding dance costumes and a hoop skirt. Containers are definitely the way to go if you need to organize stuff! The only thing that isn't organized are my patterns... I'm trying to find a good way to keep them. Any suggestions? Of course, a lot of my things won't stay where I've put them for now. In 3 weeks, I'll be moving a lot of my things into a college dorm room, and trying to figure out how to arrange everything there. But by organizing everything now, I know where things are and will easily be able to pack up what I need. Plus, by going through what I have, I know what I need to bring and what I need to buy. Having a clean and organized room is a wonderful feeling! I love organizing with plastic containers too! And that is how I organize my patterns. I bought one of those large, two-drawer plastic storage containers and it fits patterns perfectly. The drawers are the width of two pattern envelopes on their sides, facing forward (same orientation as in the pattern drawers at a fabric store). Only problem is, I was gifted approximately one zillion patterns last winter, and now I need several more of those drawer sets! My grandmother does the drawers too for organizing her patterns, and she has them organized in size order, and then in catagory order (dresses, skirts, shirts, etc.) to the extent that is possible (she has patterns ranging over 40 years of time and pattern sizes have changed a lot in those years). So, you leave in three weeks to go to college? Are you excited or nervous? I graduated this year as well but have decided not to pursue more formal schooling. however, I do understand that God leads many different people in various directions and that they all will glorify Him if we let them. I was just wondering how far away from home you'll be and what you're going for. I hope it all turns out well for you and that you will be able to stand out for Christ wherever you go...as we all should no matter where are paths take us. Being a third year college student I thought I would let you know that at the end of the semester you always come home with more than you bring lol. That being said I'm trying to pack as minimal stuff as possible. Susan and Miriam: I may have to try that. Previously, I've been storing patterns in a plastic container that allows them to be on their sides in a row. However, it can be really hard to find the one I want without pulling many out, or just look through and see what I have. I tried putting them in plastic sleeves in a notebook, but that quickly made the notebook far too thick. Hancock's is advertising a sale on pattern holders, so I'll see what theirs look like this week. Maiden Princess: Everyone has asked if I'm excited about going to college... and I really have mixed feelings. I'm probably more nervous, though I know things will work out fine. I just have a hard time thinking of leaving home. My wish was to stay home after high school and continue studying from home, but for various reasons and a desire to honor my father's wishes, I will be going to a college 4 1/2 hours from home. It is a Christian college (Belhaven College) and I'll be majoring in Theater Ministry. I pray that everything will work out for God's glory. Alexis: Thanks for the advice! It's hard to know what to bring when I've never been to college before, but I guess this first semester will teach me what I really need and what I don't!